Open All Hours is back after 28 years. This new six part series together with the original 2013 Christmas special sees Sir David Jason reprise his role as Granville who has inherited the corner shop from his beloved but miserly Uncle Arkwright. He's now running the business with his cheerful and good looking son, Leroy, who was the result of a whirlwind romance one night in Blackpool twenty odd years ago. 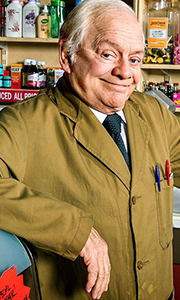 The poor lad has never really ..
Sir David Jason returns for a second series of Roy Clarke's much loved sitcom, reprising his role as Granville running the shop with his son, Leroy and continuing to serve the locals with a keen and inventive eye on a profit. Over the series, beginning with a Christmas episode, Granville is still being frustrated in his courtship of the forgetful Mavis by her formidable sister, Madge. He is sure however, that under Gastric's noisy stoma..
Own Still Open All Hours Series 3 DVD from Deff, DVD, Blu-Ray & 4K Video Specialists - Free UK Delivery..
Own Still Open All Hours Series 4 DVD from Deff, DVD, Blu-Ray & 4K Video Specialists - Free UK Delivery.. Welcome back to Arkwright’s – television’s most loved convenience store. Granville still has his sights set on romance with Mavis, and Madge is giving Gastric more attention these days, but that could be because she’s impressed with his invention skills. The Black Widow is still keeping her options open in the pursuit of Granville and Mr Newbold. Does she have competition in the shape of Mrs Rossi? Meanwhile, Leroy attempts to get B..
Own Still Open All Hours Series 1 to 2 DVD from Deff, DVD, Blu-Ray & 4K Video Specialists - Free UK Delivery..